Whether it’s a barn, garage, stable, or storage shed, any sheds built in Perth should be certified cyclonic sheds. We all know how unpredictable the weather here is and you should always be prepared for any weather conditions. Inexpensive sheds that aren’t made of the right materials and properly anchored can become projectiles in major storms and can put your house and your entire family at risk. An Action Sheds Australia cyclonic shed is rated, certified and designed to hold up in winds as strong as 316 km/h or 88m/s — this is stronger than many houses. Perth is in Region D2, whose standards for cyclones are upgraded often. At Action Sheds Australia, we keep up to date on all changes to ensure that your shed is the safest shed you can buy anywhere in Perth. Many people don’t know that offices and warehouses are often extremely large sheds. We can design and erect office and warehouse space that is cyclone rated. We can even put cladding on them for the appearance of an elite facility. Because of our design flexibility, we can build a great modern office building for a much lower price than bricks and mortar. We can also provide design work that will never let your customers know they are standing in a shed. Most of all, you will know that you are in one of the safest buildings in the Perth area. 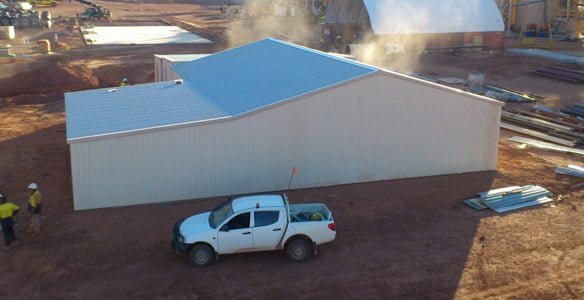 We also produce mine site buildings for the resource industry. These cyclonic sheds include an awning and inside walls. We can finish the buildings with windows and doors to ensure that your requirements are not only met, but exceeded. The standard garage or storage shed or a double shed which can be used for both can also be built to cyclone specifications to ensure that you, your house and your belongings will be safe. Our cyclonic sheds all included a 15 year cladding warranty and a 10 year structural warranty. They are ShedSafe certified and built to exceed the highest current industry standards, not only in Perth but throughout Australia. To learn more about our cyclonic sheds, please call 1300 778 628 today.